What are tags in Timely? Tags are great organizational tools and can be used in many different ways. We mainly use them to track different project phases, tasks, and sub-projects. 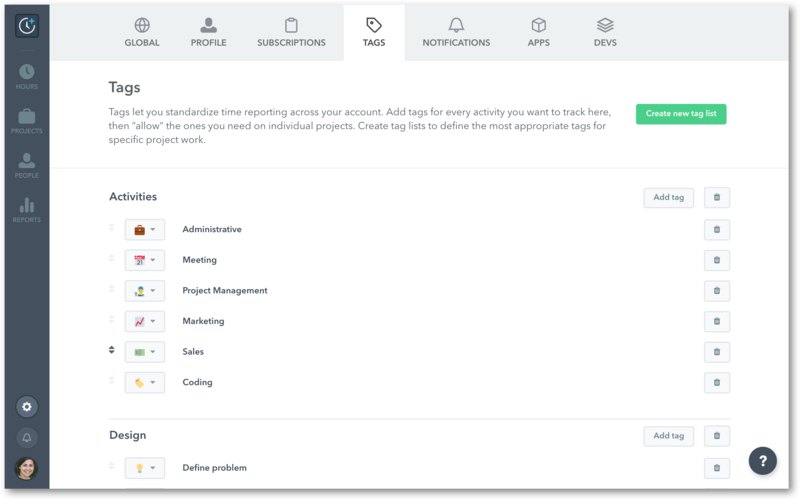 Tag Lists allow you to standardize your timesheet reporting. They can be used to track the phases and activities of a project. You can add as many Tag Lists as you'd like to a project and as many tags from those lists to an entry. These are a great way to track the granular detail of what you work on within a specific project phase. They're a really simple way of seeing how users spend their time within different project phases. Only one sub-tag can be selected per entry. Deleting a Tag in Settings > Tags will remove the Tag List and tag from any associated entries. Get a visual overview of your tags from an Individual Project page or when creating a Report template. If a Tag list includes tags, Timely will provide the total hours and/or money logged as well as a break-down of hours logged and/or money per sub-tag.